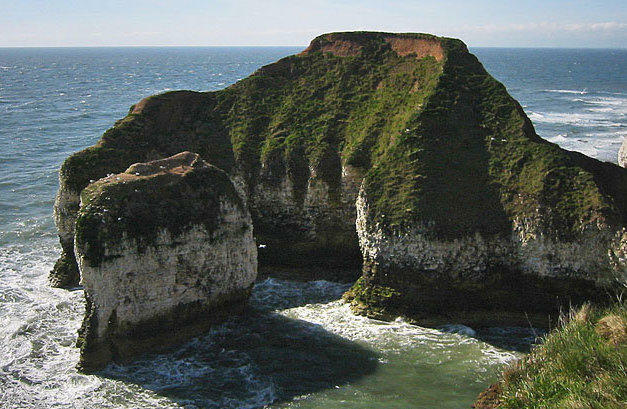 Flamborough Head is one of the most prominent features on the East Coast of England. 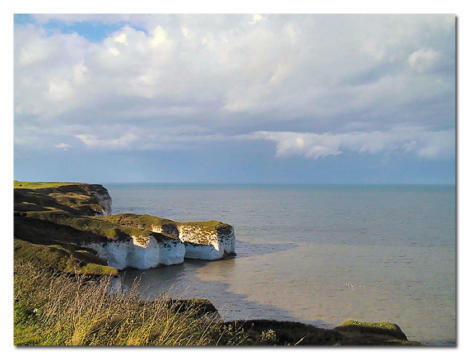 Jutting out miles into the North Sea, the headland has in the past been effectively cut off by the construction, in the Iron Age, of the erroneously named Danes’ Dyke, which encloses five square miles of the peninsula. 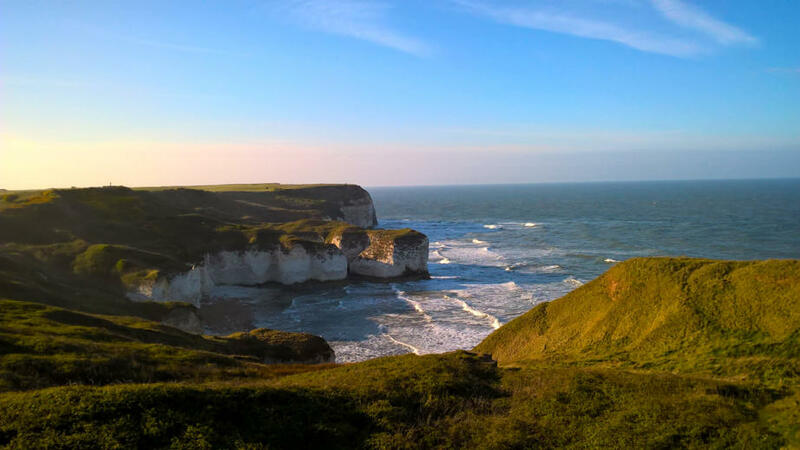 The village of Flamborough itself is situated in the centre of the Headland but the sound and smell of the sea are never far away. 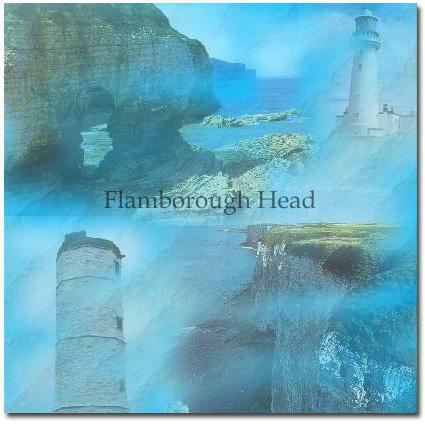 Flamborough Head was defined as a Heritage Coast by the Countryside Commission and the local authorities concerned in October 1979. In October 1982 the Flamborough Headland Heritage Coast Project was launched to promote and encourage interest in the area. Flamborough Head has much to offer. 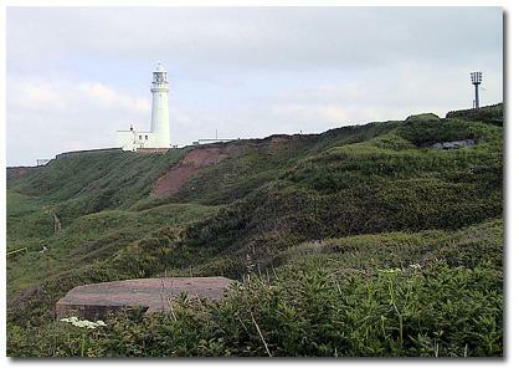 The lighthouse was built in 1806 by John Matson of Bridlington without the use of scaffolding, is 85 feet tall and stands atop a chalk cliff 170 feet high. Further back from the coast is the old Beacon light tower, dating from circa 1674, and the only known example in England. Recent restoration work has cast doubt on whether a fire was ever actually lighted atop the structure. It now stands, a gleaming monument to the rightful awe in which mariners beheld the jagged, dangerous coast. 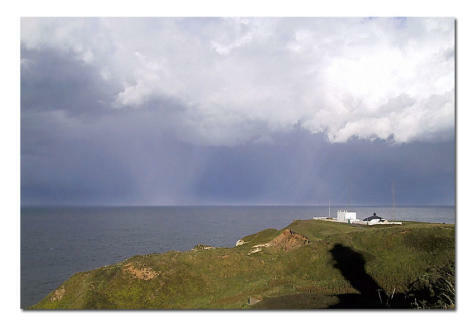 The firing of two rockets to signal a vessel in distress would bring villagers racing to North Landing to witness the launching of the Lifeboat, a sight not easily forgotten. The new lifeboat is now stationed at South Landing. Lifeboatmen in the village, instead of being summoned by the rockets, are now paged instead. 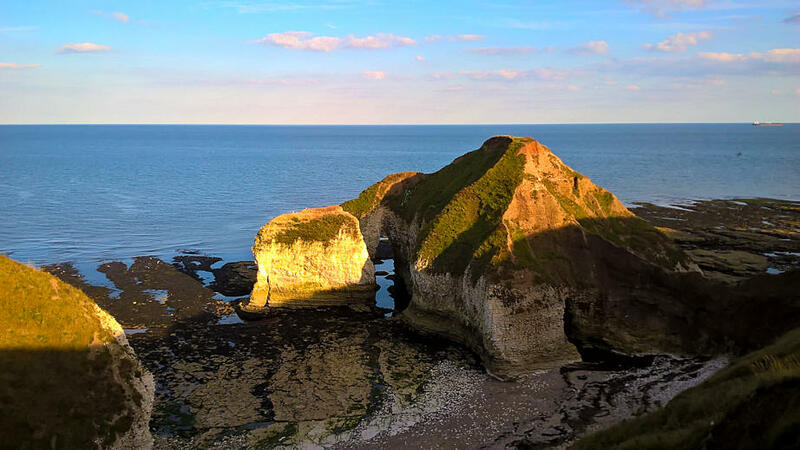 The sea off Flamborough is the resting place of many ships, none more famous than the Bonhomme Richard, flagship of John Paul Jones, which was sunk after the first action of the fledgling United States Navy in September 1779. From Flamborough lighthouse car park follow the tarmac track towards the fog signal station. As you do so, you will pass the lighthouse (now automated), which was built in 1806 by John Matson of Bridlington without the use of scaffolding. 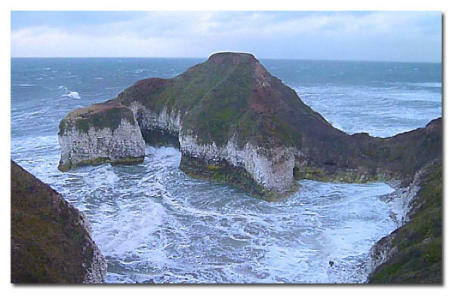 Before the advent of the lighthouse, many shipwrecks occurred as ships attempted to make their way towards Bridlington Bay for shelter during storms. The lighthouse is 85 feet high and was originally painted in black and white bands. The fog signal station, at the end of the promontory, was built in 1859. A cannon used to be fired in fog until 1877 when a rocket was used. In the early 20th century a siren was installed. Two blasts are sounded every one and half minutes and the resonant bellow can quite alarm the unsuspecting visitor. From the cliff the dramatic rock formations such as Green Stacks Pinnacle and the wave cut platform, containing many interesting rock pools, are clearly visible, but please be careful to avoid the cliff edge as it is crumbling away. At New Fall follow the hedge to Lighthouse Road passing Old Fall Plantation. This hedge and sycamore plantation provides valuable protection for bird life. Turn right and pass the old lighthouse and the coastguard station on your left. The octagonal chalk lighthouse was built in 1674 after permission was granted to Sir John Clayton by Charles ll. It was the practice of the crown at this time to grant patents for keeping lighthouses to private individuals. It was not until 1836 that all lighthouses were transferred to Trinity House. 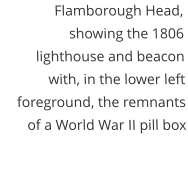 Opinions have differed over the function of the tower some considering it to have been a beacon tower used to warn in the event of invasion from sea. From 1840 until the early 20th century it was used as a marine telegraph station. The toposcope just before the car park is of some interest. It was erected to commemorate the 180th anniversary of the sea battle between the British fleet and John Paul Jones in 1779. Recorded on the top are distances from various places in the world to the Headland. Please note that Car Park charges are in operation throughout the year There is a café and gift shop situated at the edge of the car park. Please help to keep our countryside clean by taking your litter home with you. Turn left out of the lighthouse car park past the toposcope. The lighthouse was built of brick from Bridlington, in an effort to reduce the number of shipwrecks in the area. It was erected within a year without the aid of external scaffolding. The toposcope commemorates the 180th anniversary of the famous sea battle between the British fleet and that of American John Paul Jones in September 1779. 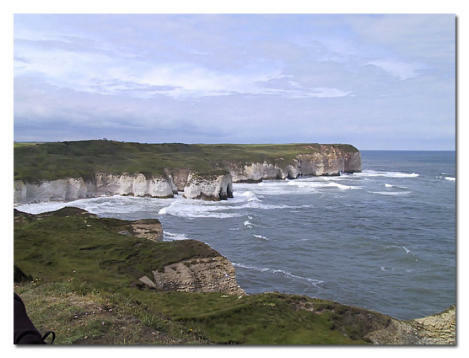 The battle was watched by the local inhabitants from the cliff top right along this stretch of Headland coast. Some interesting distances from the Headland to various places in the world are recorded on the monument. Turn right passing the coastguard station on your left. The golf course lies inland as you pass Selwicks Bay. Notice the wave cut platform but please take care to avoid the cliff edge as it is crumbling. At Breil Nook you will see the remains of the old coastguard and signal station. From Breil Nook to North Landing the cliffs are populated with sea birds in summer. 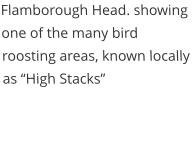 Here is an ideal place to enjoy and admire both the birds and the view. 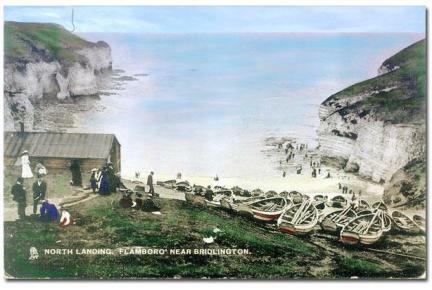 The Flamborough lifeboat was housed at North Landing and was often open to the public. There has been a lifeboat at Flamborough since 1871, the first boat being 'The Gertrude' which cost £293. The inflatable lifeboat is now housed at the South Landing. A few small fishing boats, or cobles, still use North Landing but in the past as many as 80 cobles sailed from here and South Landing. Often the fishermen would have a boat at each Landing so that he could put to sea whatever the wind direction. The cobles are used for inshore line fishing, the catch consisting mainly of cod, haddock, skate and cat fish, and for setting and collecting crab and lobster pots. 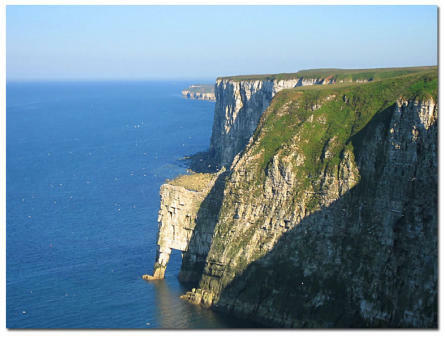 There is also the opportunity for visitors to take a half hour boating trip past the caves to Bempton bird reserve. 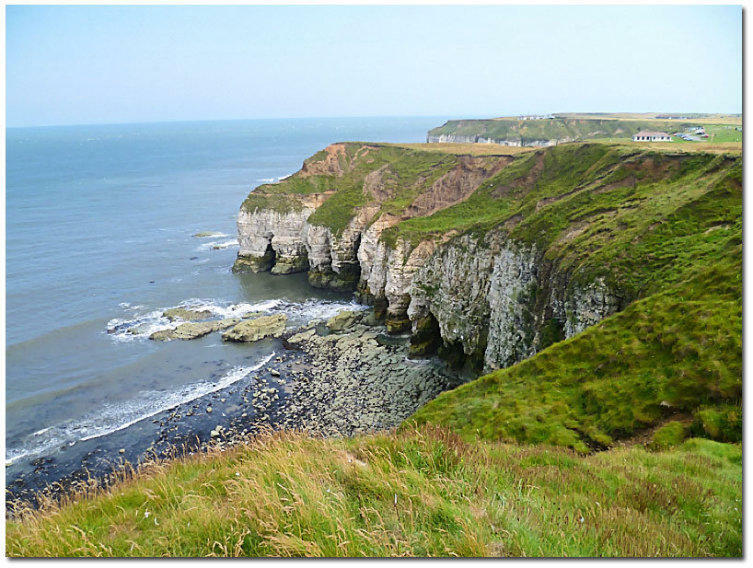 Leave North Landing by North Marine Road to Flamborough. On North Street turn left at the 'Rose and Crown' and right past North Mere Green, which was once the site of one of the village ponds, onto South Sea Road. At Lighthouse Road Turn left and continue towards the lighthouse. You pass the octagonal chalk lighthouse on the left as you return to the car park. This was built in 1674 by John Clayton. From 1848 until the early 20th century it was used as a marine telegraph station.